Students…It’s Halloween. Set your camera to portrait NIGHT MODE on the scene dial. Be very steady. This is a great way to capture the halloween witches and ghouls tonight with lit pumpkins behind them. 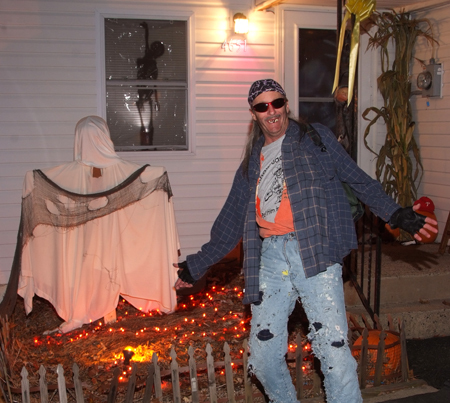 You will find that your flash will illuminate your subjects properly (within 12 feet) while your shutter speed will be slow enough to pick up the pumpkin lights. If your camera allows you to set your ISO in this mode, make sure to set it high (try ISO 800 or 1600). This will help your pictures from having movement as long as you are steady. If you own a tripod, set it up at your front door and your photos should have no problems with movement as long as your subjects are still. The best time of night is before the sun goes down completely for this night mode setting. Taking Pictures of the Stars!! A lens with a wide aperture is best to capture the dim light coming from the stars and allows for a shorter exposure time and ISO. However, it also results in a shallower depth of field, so striking a balance here is key. Start with f4.o and tweak from there. Any focal length lens will work, but keep in mind, the higher the zoom, the movement of the stars will be more exaggerated (see below). Also, You’re going to have to get familiar with some of your camera’s more advanced settings. One is “mirror lockup”, which locks the camera’s internal mirror in the “up” position in order to reduce camera vibration and increase image sharpness. Also, become familiar with your camera’s timer function, or use a remote shutter release. 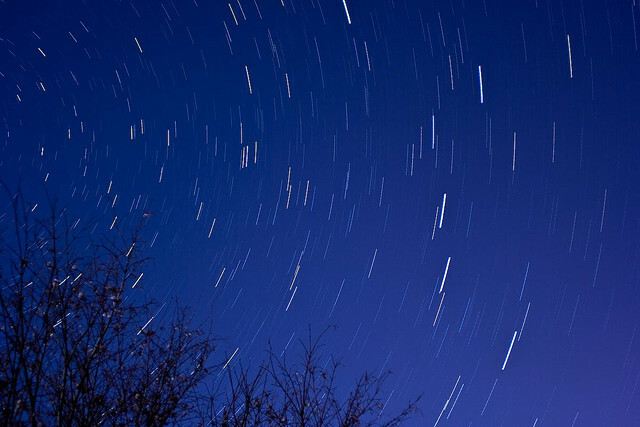 Star Trails – Capture the movement of stars as they rotate in the night sky. This requires a very long exposure – sometimes up to an hour or more. Be sure your camera’s battery has adequate power, or hook your camera up to an external power source if it has that capability. Use your camera’s “bulb” setting, which keeps the shutter open for as long as the shutter release button remains depressed and gives the photographer complete control over the length of exposure. Choose a time when the sky is clear and the moon is new, or just a sliver – exposure times will differ depending on how much light the moon is casting. During a new moon you can expose for over an hour. The longer the exposure time, or higher the focal length, the longer the “trails” will be. Set your camera up on a tripod, compose the shot, and set the focus to “infinity” (looks like the number 8, lying sideways). Experiment with the ISO – start with 100 or 200, but if you’re having a hard time finding the right exposure, keep bumping it up until you’re satisfied with the quality of the shot vs. the level of noise produced by the higher ISO. No Star Trails – Taking a photo of stars in clear focus (no trails) is very similar to taking a photo of star trails, though it’s a bit more difficult to capture a shot in which the stars really show up brightly, but without trails. If you can mount your camera with a telescope (beginner’s models start at under $100), then you can take incredible shots of trail-less stars, and even distant celestial bodies such as planes and nebula. If you don’t have a telescope mount, you will need a very dark night when the stars are very bright. Since exposure time is shorter, your camera will need all the help it can get to capture the slight cast of light that stars emit. Use a wide aperture (say, around f/2.8) and expose anywhere from fifteen to thirty seconds. Zacuto Films presents a 3-part web series, where DSLRs face off against 35mm film. Watch results & discussions by ASC, Indie, event & convergence DP’s.